New Foreward by Éamon Ó Cuív, TD. If the British Empire came into existence through a fit of absent-mindedness, was it partly lost through lack of foresight? What would have happened in the history of modern Ireland if the arming of the Ulster Volunteer Force in 1912 had been opposed by the then British government? After all, the Irish Volunteers, founded in response the following year, quickly became the well-spring of idealistic and disciplined youth that Pearse and his comrades called upon to ‘arise’ in April 1916. They formed moreover a ready-made army for the new Irish state. Paradoxically, many aspects of the Volunteer phenomenon drew successfully upon those Victorian values consequent upon the optimism of British industrialism and success of empire. Something this work makes clear through numerous articles; whether on the formation of Fianna Éireann as a native response to the success of Baden-Powell’s Boy Scouts, or in the meticulous detail taken in the designing of Volunteer uniforms. Veteran experience in the Boer War is also discussed. The memory of the South African conflict clearly had a significant factor in the foundation of the Irish Volunteers. Reference is also made in the opening pages to Grattan’s volunteer movement, established to defend the country during the Napoleonic wars. Yet what if any is the relationship between that eighteenth century phenomenon and what occurred from 1913 onwards? It is such ‘what ifs’ that make The Irish Volunteers 1913-1915: Recollections and Documents an essential reference work and a more than a timely re-issuing of an important source of primary material. Yet timely it certainly is. Some years ago while researching an essay on early twentieth century Irish history I went to the university library in search of the book. The following day, it emerged from the basement store; the last copy – and a fairly battered copy at that – still on campus. Originally compiled by F.X. Martin fifty years ago to commemorate their foundation, the book contains firsthand accounts of the establishment, organization and activities of the Irish Volunteers by its principal actors; Bulmer Hobson, Michael ‘The’ O’Rahilly, Eoin MacNeill, Pádraig Pearse, Michael Davitt, Piaras Béaslaí, Éamonn Ceannt, and Seán T. Ó Ceallaigh, along with correspondence, manifestos, speeches, subscription lists and photos. It follows a chronological approach that allows primary sources speak for themselves; covering the period from the rise of Carsonism and Casement and Childers’ gunning-running at Howth to the divisions resulting from the beginning of the First World War. F.X. Martin was an obvious editor, not only for his wide breadth of knowledge on the history of Ireland, but also as biographer of Eoin MacNeill in his The Scholar Revolutionary (1973). MacNeill after all was central to the establishment of the Volunteers and arguably to their acceptance by the Redmondites. Moreover he is a prism through which the subsequent turbulences and divisions of the Irish revolution can best be seen. Remembered primarily as the man who attempted to call off the Rising, MacNeill’s views on the physical force approach at the time of the Volunteers’ establishment were more ambiguous than might be thought and his pivotal role in their establishment makes sense of his subsequent anger at their usurpation by the IRB. This re-issuing contains all the material of the first edition, including Éamon de Valera’s original 1963 foreword, along with fulsome introductory articles that give considerable contextual background for the uninitiated. In that respect the work would be of interest not to the academic alone, but to anyone interested in the background to the foundation of the Irish state. Where the decade of commemoration understandably makes noise over the great events; the Lockout, the Rising and the Civil War; the story of the formation of the Volunteer movement sets much of what occurred subsequently in Ireland in a wider context. Indeed if this volume has as wide a readership as it deserves it could well serve as a starting point for considerable research and re-thinking. As a volume containing the voices of those who were there at the beginning it can aid those seeking to peer through the fog of past wars and their current legacies. It was in the broad church unity that was the Irish Volunteers that the seeds of future division lay in plain sight. 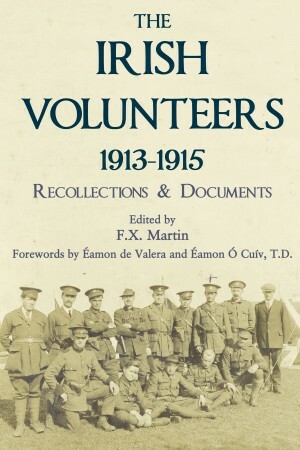 One Response to "Book Review: The Irish Volunteers 1913-1915: Recollections and Documents"
Éamon Ó’Cuív and Dr. Ruán O’Donnell discuss the history of the group.